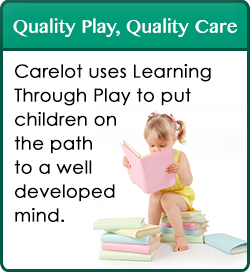 Carelot’s theme based curriculum is planned cooperatively with the Directors, Asst. Director, Head Teachers, Teachers and Assistants. Each day is filled with a balance of structure and free play, group and individual activities, outdoor time and rest time. Weekly themes are used to integrate concepts and skills being taught. Activities focus on taking a hands-on approach to learning. Our program is designed to maximize the developmentally appropriate practice for each child. Our curriculum focuses on the process of learning. For example, painting is more important than what is painted & building with blocks is more important than what is built. Carelot’s curriculum includes, sharing and conversation time, stories, songs & finger plays, music & movement, creative art, sensory games and large muscle activities, science and nature explorations, community and cultural awareness, self help skills, field trips and much more! It is our Philosophy that learning through play is a key part of the early childhood learning experience, which combines active involvement with adults, children and materials. It is important for children to have experiences with real objects before they understand the meaning of symbols, such as letters & numbers. It is for this reason that our hands-on approach to learning is important for the children to experiment, touch, manipulate and interact with their environment. Through quality play activities, the children gather valuable information as they develop important skills for future academic success! A detailed outline of the program in which your child will be enrolled is available from the office.